Sometime we prepare cocktails of fruits as follows. Instead of tasting single fruit, we taste here mixed fruits. orange and 6 mls of lemon essences together. Now prepare the mixed fruit squash following the procedure for preparing squash exactly. When serve constitute adding water to the concentrated syrup water as explained for squashes. We had seen so far how fresh jams, jellies, morabbas and squashes are prepared from natural fruits. There are MNCs that advertise about their products stating that they prepare from original natural fruits without any chemical substances but it is not true. Hence it is better to prepare these at home to be sure. Sometimes we may not have these readily available and exhaust the stock. In such cases, the syrups prepared will help us. These are nothing but artificial juices of the fruits. Here we take the required quantity of sugar with water and boil with a few citric acid crystals to get syrup of single thread consistency. The scum is removed by filtering over a fine clean muslin cloth and to this raw syrup we add appropriate fruit essence and colour to prepare the syrup of that fruit. Normally, the best ones are orange, lemon, rose, pineapple, raspberry, khus khus syrups prepared as above from their essences and colour. Prepare sugar syrup as above. To this add 3% of Rose, 2% of Kevda and 1% of khus khus essences mixed prior hand together along with a few drops of either raspberry red or Tartrazine red colour. Shake well and refrigerate. Boil the milk to remove excess water and to become moderately thick. Cool. 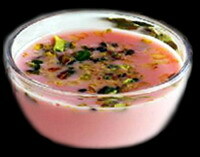 Add Roohafza and sugar to milk little by little and stir well till they dissolve. Taste and adjust sweetness by adding a little more sugar and Roohafza if needed. Add vanilla extract. Mix well and refrigerate overnight. Just 10 minutes before serving, take a little of the milk and mix in it the saffron strands well and add to the sharbat already refrigerated. Crush the nuts into a bit coarse powder after frying them in a little ghI powder the cardamom with a little sugar. Add these also and then serve. It is very tasty if you sip slowly. This entry was posted on May 11, 2012 at 12:54 pm and is filed under Jams, Morabbas, Squashes and Sauces with tags apple syrup, citric acid crystals, essence, food colours, grape syrup, Jam, Jelly, lemon syrup, mango syrup, Morabba, orange syrup, pectin, pineapple syrup, potassium metabisulphite, raspberry syrup, roohafza, sauce, sherbat, sodium benzoate, squash, sugar, syrup. You can follow any responses to this entry through the RSS 2.0 feed. Both comments and pings are currently closed.